Why is Muslim Brotherhood CAIR on FOX news right now? The Islamic supremacist Ahmed Rehab is on FOX denouncing Mubarak, advocating for overthrow. Horrible. We expect this from the leftist apologist cable networks, but FOX is dangerous because they pretend to get it. CAIR has been sending out press releases pushing Obama to push Mubarak out (so, inevitably, ElBaradei, Iran and the Brotherhood can take over). If anyone can get video — please send it. FOX must stop this propagandizing for the Brotherhood via CAIR. Or at least identify them as such. Why do they cover for them? Why Does the American Conservative Union Welcome Suhail Khan? Yesterday Roger Kimball at Pajamas Media had a piece on the controversy surrounding CPAC and the American Conservative Union’s board member Suhail Khan. See a lot more on Khan’s troubling associations here, here andhere. Remember this anti-FBI propaganda posted on terror-linked CAIR’s website a few days ago? It turns out that the mother of Suhail Khan – the so-called “conservative” Muslim being exposed for his terrorist ties – is an executive member of the CAIR chapter who produced the poster. Mr. Khan’s mother works for CAIR, and is listed alongside Ahmad as a member of the executive committee of CAIR’s San Francisco Bay Area chapter. Malika Khan’s chapter last week put up a poster on its website advising Muslims: “Don’t talk to the FBI,” and “build a wall of resistance” against law enforcement. But that’s not all. According to the “Contra Costa Times” and other local press, Mr. Khan’s family mosque has hosted several Taliban supporters, while raising money — unwittingly or not — for Hamas through its U.S. charitable front, the Holy Land Foundation. The mosque happens to be held in trust by another unindicted Holy Land co-conspirator — the North American Islamic Trust. The government recently blacklisted Saudi-funded NAIT as part of the Hamas fundraising conspiracy. It also happens to be the banker to the Muslim Brotherhood network in America. But it’s not just the mosque that’s a concern. Mr. Khan’s father also founded the Santa Clara-based American Muslims for Global Peace and Justice, whose chairman defended the Taliban even after 9/11, according to the Associated Press. So what “peace” and what “justice” are we talking about here? That should give everyone in Washington pause. Much more via FrontPage Magazine. Officials with the Council on American-Islamic Relations (CAIR) are painting a deceptively rosy picture of the organization’s relationship with the FBI. The spin follows the group’s decision last week to remove an anti-FBI graphic posted on its San Francisco chapter’s website. The graphic depicts a sinister-looking FBI agent walking down a street as doors slam shut. “Build a Wall of Resistance,” it reads. “Don’t Talk to the FBI.” CAIR issued a clarification statement calling it “inconsistent with CAIR’s policy of constitutionally-informed cooperation with law enforcement agencies.” The group had included the graphic as part of a “Know Your Rights” event it co-sponsored in response to severalFBI raids conducted during September 2010. Corey Saylor, CAIR’s national legislative director, said on Fox News’ O’Reilly Factor, that he is “troubled” by the media’s critical reaction. “I can speak of a number of different occasions of CAIR’s consistent policy of cooperating with law enforcement,” he said. Congrads to the city DuPage for standing up to radical jihadis. The jihadis CAIR is trying to make the US military less effective. Poisoning us from within. NEW YORK, Jan. 17, 2011 /PRNewswire-USNewswire/ — A prominent national human rights and advocacy organization is again asking the Defense Department to resist efforts by the Hamas-linked Islamic supremacist hate group the Council on American-Islamic Relations (CAIR) to dictate the nature and content of anti-terror training for military personnel.That renewed request by Stop Islamization of America (SIOA) comes after Hamas-linked CAIR, one of the nation’s most notorious Islamic supremacist hate groups, demanded that the Defense Department not invite the noted Islam scholar Robert Spencer to offer training to military intelligence personnel. SIOA respectfully requests that the Defense Department repudiate this attempt by Hamas-linked CAIR to hinder national security by interfering with and impeding counterterrorism training. It seems the jihadis do not care about american history in there attempt to convert us or make us their slaves. AIR bills itself as a “civil rights” organization although it is not. If the issue doesn’t benefit Muslims, Islam or sharia, you can bet CAIR is nowhere to be seen. That’s why it’s no surprise that they have hijacked the MLK, Jr. holiday and converted it into Muslim Capitol Day. Featuring: Imam Siraj Wahhaj who will join us during the day’s events and will be the keynote speaker during the lunch/fundraiser. Also featuring various state legislators TBA. Yes, that is the same Siraj Wahhaj that sharia-promoting Ground Zero mosque imamFaisal Rauf’s replacement has close ties with. CAIR the jihadi group took down the anti FBI image CAIR attacks the FBI. But they seem to still be supporting Hamas and installing Sharia here. CAIR AKA Council of America Islamic Relations pretends to be a civil rights group. They are really a terrorist group. They are an unindicted coconspirator in the Holy Land trial. Where CAIR and other jihadis groups where going money to Hamas to buy weapons to kill more jews. This terrorist group is not attacking the FBI. The far-left often join up with Islamists to work together politically causing agitation/activism/pressure/lawsuits against our government. In this case, it’s the FBI. A website called Committee to Stop FBI Repression is one such group that is based in Minnesota. Notice the screen shot I took today (below) shows a link to SEIU Illinois State Council Resolution Condemning FBI Repression (SEIU: Service Employees International Union is a big supporter of Obama). A prominent national Muslim civil rights and advocacy organization announced today that its new public service announcement (PSA), called ‘I am Muslim, I am American,’ began airing this morning on the CBS Super Screen in New York City’s Times Square. The Washington-based Council on American-Islamic Relations (CAIR) said its New York chapter (CAIR-NY) produced the 15-second PSA, which will air every hour for 18 hours each day through January 16, 2010, on the 26-foot by 20-foot full-motion screen. More than one million people pass through Times Square each day. CAIR-NY’s PSA features an American Muslim NYPD sergeant, as well as a Muslim Little League all-star, a human rights activist, a doctoral candidate, and an attorney. 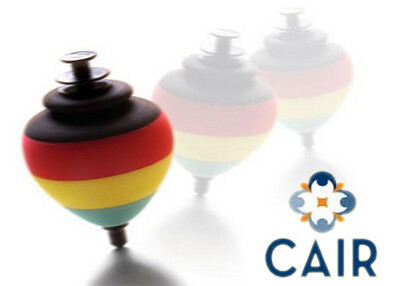 It begins with the statement, ‘Building Community, Serving Country.’ Viewers are encouraged to visit CAIR’s web site. So, for those of us who will NEVER forget how radical islamic terrorists attacked the twin towers in New York City, we get to look forward to Eric Holder holding the KSM trials right there in the backyard of Ground Zero….and now, in a perfect example of jihadi ‘in your face’ taunting, the corrupt terrorist organization, C.A.I.R. (Council on American Islamic Relations) is running an advertisement showing a muslim NYPD officer. Yeah, that’s cool huh? Let the memories of fallen NYPD and NYFD be mocked each and every day by this advertisement. I wonder, does CBS know that some of us aren’t very happy about this advertisement? (WASHINGTON, D.C., 12/22/09) – A prominent national Muslim civil rights and advocacy organization announced today that its new public service announcement (PSA), called ‘I am Muslim, I am American,’ began airing this morning on the CBS Super Screen in New York City’s Times Square. Ali added that the PSA will air during the New Year’s Eve celebration in Times Square, when up to one million people turn out to watch the ball drop at midnight.